High-speed telephoto lenses like these two are designed to offer the very highest image quality but they’re somewhat pricey and restricted to specialist use. Where once the 300mm was the most popular, the 400mm is, arguably the most flexible in the range (especially when used with tele-converters with the aim of maintaining autofocus) and therefore the most sort after today. Both models share a number of similar features including three ED glass elements, Nano Crystal Coat and an ultrasonic type AF motor. Both models also feature the latest 4-stop VR II spec image stabilization and have prices to match. At $5,900 and achieving a high DxOMark Lens Score of 34 mounted on a 36Mpix D800, the latest iteration of 300mm f/2.8 from Nikon is an excellent performer. It has untraceable distortion, and both vignetting and chromatic aberration are barely noticeable. However, while the lens is sharp with excellent performance across the frame. We know the sensor isn’t as efficient as the pixel count suggests, but the low-ish score may be as a result of the lens. 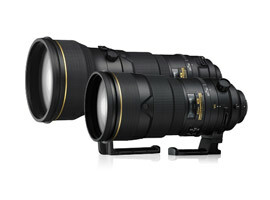 With a DxOMark Lens Score of 35, the latest Nikon 400mm f2.8 model is another excellent performer. 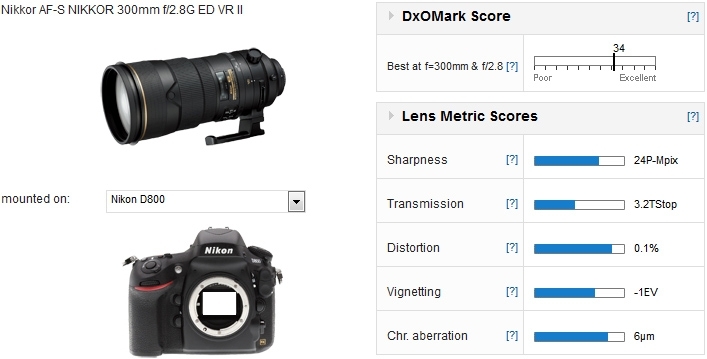 The 25P-Mpix score is one of the highest in its class, and suggests that this lens might be able to achieve an even higher Sharpness score when analyzed with a camera such the D800E. If we compare the Nikon lens mounted on the D800 against rival offerings from Canon (mounted on 5D mark III) and Sony (mounted on SLT A99), the Nikkor performs very similarly to the newer $6,599 Canon model and even comes close to that lens in chromatic aberration (quite a feat considering the use of fluorite in the Canon). The same can be said for the $7,500 Sony, though in terms of sharpness that model is slightly disappointing, at least when mounted on the Sony SLT A99. 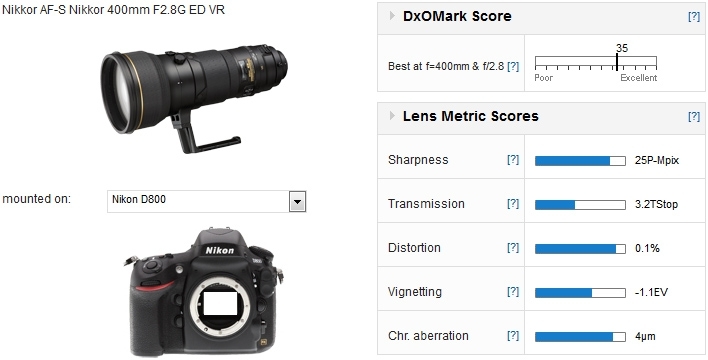 As with the 300mm f/2.8, the Nikkor 400mm has a similar performance to the newer $10,499 Canon, and even surpasses that model in its Sharpness score – though it is important to remember that the Sharpness score and the overall DxOMark Lens score is dependent on the performance of the sensor. 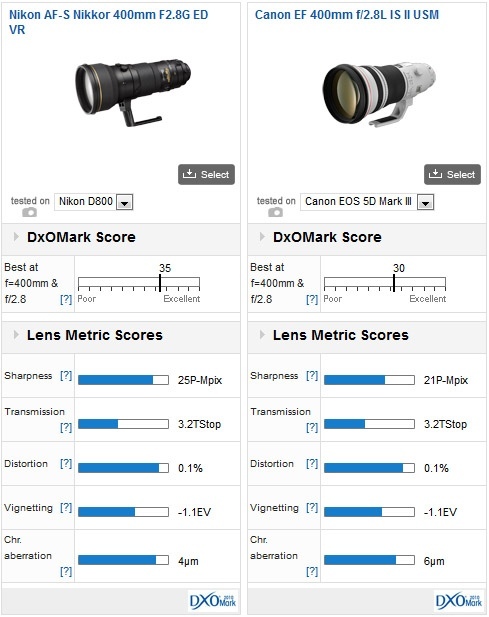 If the Canon lens was tested using a camera with a higher resolution sensor and a wider dynamic range the DxOMark score would maybe improve. Be that as it may, when combined with the D800, the Nikkor 400mm f/2.8 is an outstanding performer and even has slightly lower levels of Chromatic Aberration than the pricier Canon. When we tested the Nikon 500mm and 600mm f/4 models the performance, while very good, was slightly behind that of the newer (and pricier) Canon models. 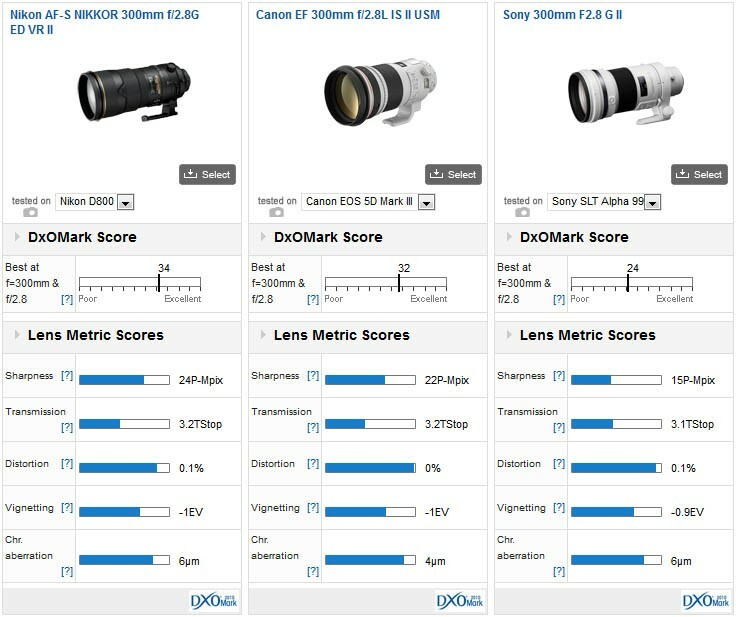 In a slight reversal of fortunes, the Nikon 300mm and 400mm f/2.8 models actually appear to outperform the latest Canon offerings, at least when mounted on the Nikon D800 (though bear in mind this sensor has both high resolution and a wider dynamic range than the Canon EOS 5D Mk III used to perform the tests with the Canon lenses. Given the price advantage of the Nikkor lenses currently, Nikon users and potential purchasers can rest-assured that either model is a good choice and a sound investment in the long term.